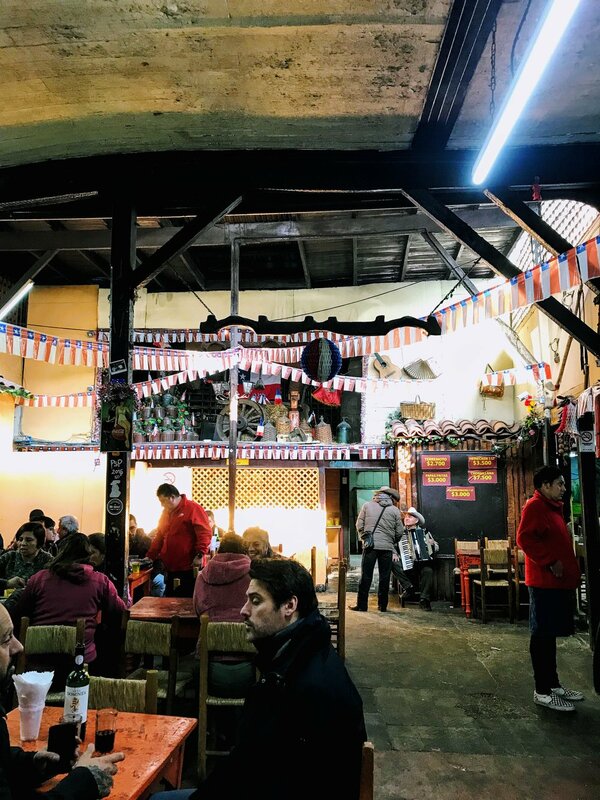 I visited a Santiago institution, La Piojera, to try their famous Terremoto (earthquake) drinks. We were warned by several people to guard our belongings and generally avoid it at night. Obviously I went at 8pm with 5 gringos who (mostly) don't speak Spanish. Read this guide to enjoy your own terremoto at La Piojera. The place is decked out in Chilean flags, resembling Independence Day year round. There are singers, guitars strummers and a party atmosphere any time you go. The patrons range from working class Santiguinos to curious visitors like us who hope to feel the power of a terremoto. Fun fact: Piojera translates to "fleahouse" and was nicknamed as such by President Arturo Alessandri Palma on his visit in 1922. For other fun facts about Santiago, don’t forget to read my Walking Tour of Santiago Guide. Back to those terremotos - what exactly are they? Fermented wine, grenadine (or fernet) with a dollop of pineapple ice cream. They're cloyingly sweet, and surprisingly strong. So strong, in fact, that they don't let you have more than one. If you do dare to have a second round, you'll be given a replica (aftershock), which is a smaller version of the terremoto. Legend has it that you can also order a third (smaller) version of that, but no one has lived to tell the tale. Pretty f*kn strong. I was 3/4 through my drink before the room was spinning, and I found myself laughing a little too hard at Mike's "jokes." Here's a terrible photo I took of my terremoto! *Please remember that this could be entirely fabricated because we still can't understand Chileans very well. And that's a wrap on our first dive bar in Santiago. WANT TO SEE MORE VIDEOS ABOUT CHILE? DON’T FORGET TO CHECK OUT MY YOUTUBE FEED! DON’T MISS THESE POSTS BELOW!